You wouldn't think that gems could be so sensative to candlelight, would you? These ones in particular are easier to spot using light magic, especially when they glow in it's proximity. So after looking into a slight design change for Brontes, I trialed a few stripe patterns to get an idea what looked what. In effect reducing the number of stripes would make him a more appealing character for art in future, having had difficulty getting MLP Zebra stripes right. Upon a suggestion, I looked at keeping the muzzle marking, to show he had zebra DNA as well as unicorn. This looked fairly manageable for drawing by hand, even more so when applied to the model, as see above. The scene itself was done entirely in blender's Internal renderer, due to being on my old laptop and not having all the time to wait for cycles to clean up properly. Suprisingly you can set it to use emissions from a mesh for lighting, though it isn't as effective as a dedicated lamp. Throw a glare node on top of that and you get a rather neat effect, especially around the horn! Brontes (character) owned by me, modified from MirceaKitsune's MLP set from BlendSwap. 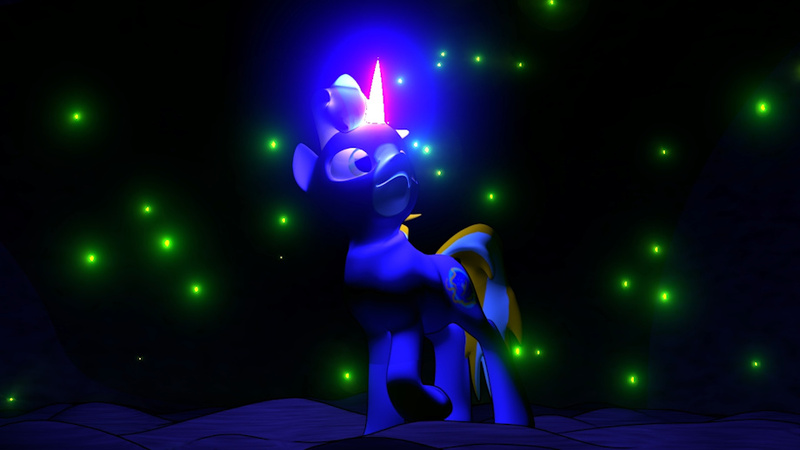 MLP:FiM belongs to Hasbro & all other associated copyright holders.